I would like to get a copy of the following record. How would I go about this? Groom's Name:James Colvin Groom's Birth Date: Groom's Birthplace: Groom's Age: Bride's Name: Catherine Freeman Bride's Birth Date: Bride's Birthplace: Bride's Age: Marriage Date: 09 Nov 1864 Marriage Place: Carluke, Lanark, Scotland Groom's Father's Name: Groom's Mother's Name: Bride's Father's Name: Bride's Mother's Name: Groom's Race: Groom's Marital Status: Groom's Previous Wife's Name: Bride's Race: Bride's Marital Status: Bride's Previous Husband's Name: Indexing Project (Batch) Number: M11629-1 System Origin: Scotland-ODM Source Film Number:6035516 Reference Number: ___________. Ol' Myrt here commends you for wanting to move beyond an index to the original document. It looks like you've copied and pasted info from an indexed entry for your ancestors at FamilySearch.org. I searched FamilySearch.org and found the entry in question. 1864 Colvin-Freeman Scottish marriage record index from FamilySearch. The quick answer is to advise you to order the marriage record online from the ScotlandsPeople.gov.uk website, since you have the bride and groom's name and the date. Scotland was the first country to partner with a commercial organization to provide access to public records online for a small fee. But your query points out a flaw in the FamilySearch page you viewed. It should push you toward finding the original marriage record, but the microform number 6035516 does not contain the image of the marriage record, nor does it contain any references to individuals. To prove my point, I took a field trip to the Family History Library and consulted with several employees there. I also brought a printout of your query paragraph. (It is the green paper in photos below). This is my report. Now you and I both know the LDS Church didn't create parish registers in Scotland from 1855-1955 and provide copies to Family History Centers, so a little more background on this might be in order. Delving further, we discover that the British Reference Desk consultants at the Family History Library created this register that is an aide to accessing Scottish church records "index, 1855-1955, and certificates 1855-1875, 1881, and 1891." The catalog entry explains "Use the register by turning to the county. These are listed alphabetically. Find the parish number in the listing at the beginning of the county. Turn to the event year and find the parish number in that year. The microfilm number for the certificates is identified across from the parish number." 1. I went to B-2, the British Isles floor, and located the "6035516"microfiche in a bank of drawers. 2. To my surprise there were 2 complete and 1 partial set of "6035516" microfiche. A five minute review of each determined they are duplicates. I spent some time reviewing the introductory pages on the fiche to get a quick study about this index on fiche. The fiche do not contain 100 years of marriage records for many Scottish parishes as one would think from the "Source" reference on your original query. Instead, the fiche include the staff's index to the location of Scottish parish records on a series of microfilm elsewhere in the FHL collection. Why the FamilySearch.org entry for your ancestor listed "6035516" as the source for your specific ancestors' index entry is beyond me. There was nothing on the fiche about individuals, but instead contained information about Scottish counties and parishes. 3. Looking up "Lanark" (the county in Scotland) was a snap. From there, I made note of the code next to the parish of "Carluke", your ancestor's marriage place. 4. Using that code "629", I then moved to a different portion of the microfiche, where I took the year of the marriage "1864" and that "629" code to determine I needed to pull the "323630" microfilm to hopefully view the marriage record itself. 5. Next, I pulled the "323630" microfilm from the drawer. Fortunately British Isles microfilm are found on the British Isles floor at the Family History Library, so it was just a few rows away from my initial workspace at the microfiche reader. 6. I scrolled through the microfilm to get to the "Carluke" entries. There were multiple parishes on this film. 7. I located the specific entry for your ancestor, and per my custom, took a picture of the image with the microfilm box indicating the film number to make creating a citation easier. I also made a scanned copy of the image. Don't rely solely on indexes. Always obtain a copy of the original record. Unless someone lives in the greater Salt Lake City area, working through the microfiche to then find the appropriate microfilm to order through a local Family History Center will add weeks of delays to the process. 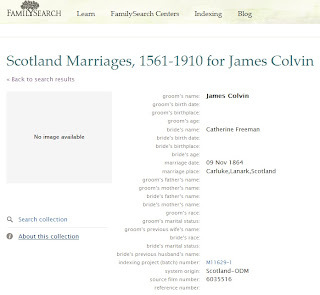 FamilySearch should revise their screen so that the true "source" of an indexed entry is indicated on this large collection of Scottish marriage records. Failing that, a description of this process for getting to the microfilm of the original should be linked on that page. And so, DearJACKIE, I'll now send you a copy of the marriage record for your ancestors via email. Well, Myrt, I'm pretty familiar with these records, and the LDS fiche, but I've learnt gradually over the last 20-something years. Your post made me realise how confusing it must be for someone who encounters them for the first time via FamilySearch. Getting the records on Scotland's People is a breeze by comparison. It doesn't help that FamilySearch has lumped together all the Scottish records into 2 collections (births/baptisms and marriages) instead of listing them separately as Statutory Records, Scottish Church Records, Nonconformist records etc. One more thing for my list when I next berate the powers-that-be at FamilySearch and tell them what is wrong with their classification of British Isles records on the site. Ten out of ten for beating a path through the system for your enquirer, and producing the actual record at the end. And shame on the FHL staff for suggesting you wouldn't need to see the original! But aren't those Scottish BMD records fabulous? I'm so glad that all my family lines are in Scotland back to the mid-19th century, and most of them are still in Scotland much earlier too. Just a quick addendum to my first comment. I've had a look at the marriage on Scotland's People, and in their defence, FamilySearch actually has the right date, 9 November, for the marriage. This is because in Scotland the marriage and the the official registration are two separate events, and the registration is often a day or two later than the wedding (too busy partying to go straight to the Registry Office, I expect). The marriage date is in the first column, and here it is written in words, not numbers, for some reason, while the registration is in the more usual number format. I have no idea why. I think the less experienced among us would not have known how to get to where you did with this, thank you for the step by step guide. Hi Myrt, what a wonderful gift you have given to Jackie and an excellent example you have provided to your readers. I have run into problems of this similar nature several times in the couple of years I tried using my FHL center and microfilm. I finally gave up and stopped ordering film because it was getting expensive and I couldn't quite "get" why I wasn't ordering the correct records and the people at the center could not help me, nor were my emails to FamilySearch returned or my questions answered. Thank you for reminding your readers to consult the original records as well as the index! I cannot stress this enough either. Thanks again for sharing this process too! Ginger, I had this happen to me only once and the FHC director credited me my money and sent the film back. You should have spoken directly with the director or called the FHL until you got satisfaction. While I know the FHL is a wonderful resource, the staff is mostly volunteer and rotates more often than in most businesses. So is the staff at most FHCs. They don't know everything and don't often realize there are solutions. I would guarantee, the administrators at the FHL want their facility to be the best in the world and the patrons glad to be a part of it. Persistence paid off but your knowledge and experience were a huge factor in this successful outcome. Thanks, Myrt, for sharing the process with us. Your post would provide the basis for some PD for the volunteers on the British Floor at the FHL. OMG! Reading this entry gave me (a relative "newbie" to family searching) a headache. Ouch. Ditto on all the above comments, Pat. These details of the process of digging'n delving for the actual copy of a record - priceless! I learn so much by following along your step by step analysis of where next and why... Thanks so much! I was able to get to your step 5 without leaving my desk using the Family History Library catalog. I agree it is not easy and I had to use the old version of the catalog because the new one keeps getting an error. Go to familysearch.org and click on the link to the previous site and navigate to the FHL catalog. Do a place search for Scotland and choose the category of Civil Registration. Click on the listing for Registers of births, marriages, and deaths, 1855-1875, 1881, 1891; and general index, 1855-1956. On the Title Details screen (the first one that shows up) is a listing of the parish numbers for each parish in Scotland. Use CTRL + F to find Carluke on the page and you will find that the parish number is 629. Then click on the View Film Notes button. Don't panic when you see that there are 4483 film notes. (I think this is what causes the new catalog to return an error). The Film notes have four sections, Index, Birth, Marriage, and Death. They are in parish number order by year order. At the bottom of the screen there is a box that says Get Film Notes from number. Since we want a marriage record, I estimated that it would be about 1/2 of the way through the list and entered the number 2000. This does take you to the marriage section but the parish number is 107. We want parish 629, so we need to go further in the notes. I entered 2500 in the Get Film Notes box and it brought up the right section of the notes for parish 629, but the years don't go to 1864. You will need to click on the next film notes link to get to the right section of the notes for marriages in parish 629 in 1864. You will see that parishes 621-643 are on FHL film #323630 (which is the film Jackie could order to her Family History Center without having to deal with the microfiche at all). When you looking at the film, it might be helpful to know that you will have 8 parishes before you get to Carluke. I also agree that Scotlands People is much easier and cheaper unless you are going to be in Salt Lake City and plan to look at a lot of records. What a lot of time-consuming work - I'm pleased that I live near the ScotlandsPeople Centre as it's so much quicker using their system, or their website.